As if to prove me wrong, he stares earnestly at the screen and throws out a few dozen more glow sticks, disturbing the various eels, crabs and dolphins he's supposed to be photographing. In the face of such obvious enjoyment, my insistence that he define accomplishment according to my perspective seems kind of ridiculous and more than a little self-centered. Now that I've given up trying to make him enjoy these games on my terms, we have a lot more fun playing together. 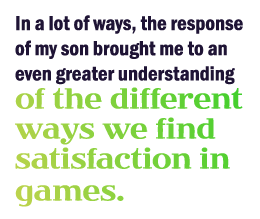 In a lot of ways, the responses of my son to games I thought I understood brought me to an even greater understanding of the different ways different gamers find satisfaction in games. I remember the weekend after I reviewed EA's daringly mediocre Medal of Honor, and I was surprised to hear a good friend of mine, who also plays lots of shooters, call it an amazing game. He just couldn't stop talking about how much fun he was having. Compared to my own opinion of the game - that it was, at best, courageously boring - he might as well have been describing an entirely different game. When I first started reviewing games, this kind of contrary opinion would cause me to vacillate between dismissing them outright and obsessing over whether I was out of touch with the expectations of a particular genre's fans. Now that I'm older, and have been doing this for a while, I accept that we all play games for different reasons. So when the opinions of a friend are wildly out of step with my own, my first question is whether or not we're simply enjoying (or not enjoying) the game for different reasons. If you like the modern military context of Medal of Honor or the space opera vibe of Star Wars: The Force Unleashed, you may not mind that the mechanics aren't great. And if you're captivated by the mechanics of games like Tetris or Hearts of Iron, you won't care that those games don't offer much in the way of visual spectacle. Believe it or not, there's also a long list of games, from Dragon's Lair to Crysis, where the sheer visual brilliance receives far more attention than the actual game design or story. Even this list displays my own biases, so spare me your attempts to argue that Force Unleashed had great gameplay, or that Crysis actually had a story. In short, not only do we like different types of games, but we often like the same types of games for entirely different reasons. Nothing has taught me that nearly so clearly or thoroughly as watching my own son sit down to play his favorite games. Free from the restraints of the designer's strategic goals or an understanding of the abstract value of points or unlocks, he just sits and plays. If you asked him why, he'd just simply say, "Because it's fun." For him, that's as far as it needs to go. Steve Butts is Managing Editor for The Escapist. He is still waiting for his kids to realize what a tremendous Lego collection they've inherited.